The all-in-one COMPLETE Supplemental Workbook (coil-bound) - designed to be completed with the Complete Rudiments Workbook! UMT COMPLETE Supplemental Workbook has been added successfully to your wishlist. 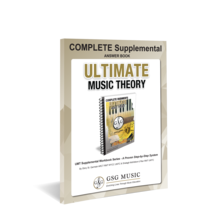 The COMPLETE Supplemental Workbook is designed to be completed with the Step-by-Step Complete Rudiments Workbook. 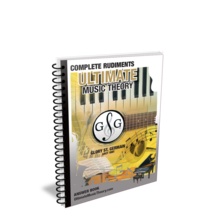 This impressive coil bound (214 pages), 9 X 12 workbook is a condensed edition of all LEVELS (1 - 8) of the UMT Supplemental Series and helps prepare students for college entrance exams and nationally recognized theory exams including the Royal Conservatory of Music. Bonus - Free Resources - Instant access to Music History Videos for all listening activities in the workbook. 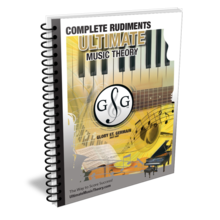 UMT Complete Rudiments Workbook plus the UMT COMPLETE Supplemental = RCM Theory Level 8. The COMPLETE Supplemental Workbook features these concepts and more! 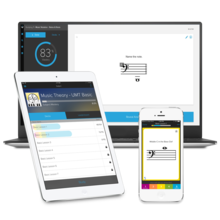 The Ultimate Music Theory™ Program and Supplemental Workbooks help students prepare for nationally recognized theory examinations including the Royal Conservatory of Music. Note: UMT Answer Books are available for ALL Levels. Complete Answer Book has been added successfully to your wishlist. Complete Theory Workbook has been added successfully to your wishlist. UMT COMPLETE Supplemental Answer Book has been added successfully to your wishlist.